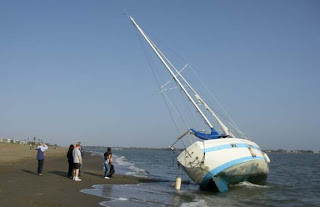 This is not going to be a detailed discussion on the stability of small boats. I will actually write something for my website and it will be concise and definitive. My intent here is merely to commit myself to writing this new page for my web site. What is prompting me to do it is the persistent mention of secondary stability in kayak and canoe magazines. Three things about this concept. 1) All kayakers use the term as in, "Yeah, I tried that boat. It has low initial stability but good secondary stability." 3) Such definitions as you can find seem to be subjective and conflicting. So I will tackle this topic as best as I can. 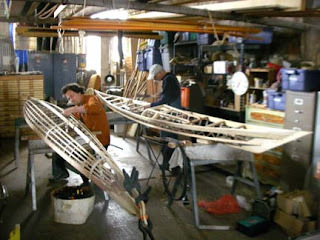 Some pictures of boats being built. A Greenland one and an Aleut one. My wife just informed me that today is May day. In many parts of the world, this is a holiday, kind of like Labor Day in the US. I suspect that we don't celebrate May Day in the US because of socialist overtones that the day has acquired. 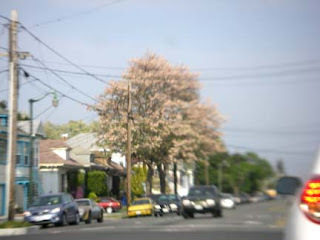 In any case, it is spring here in California. 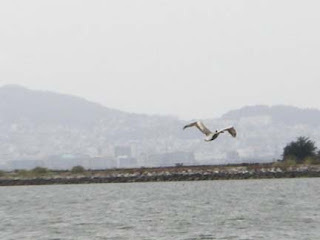 Currently, the locust trees are in bloom, and yesterday, the brown pelicans returned to SF Bay. Surely Summer must be near. Pictures of locusts and pelicans to follow. A pelican fishing in the seaplane lagoon out front of the shop. They fly into the wind which is coming out of the west and when they see something in the water, they fold their wings, turn on their backs and hit the water with their beaks open. Even at a hundred yards distance when you can't hardly see the bird, you can still see the splash. One of the locusts in bloom. We also have white ones. For those of you paying attention to the title of the post, I skipped directly from part 0 to part 2. There is no part 1. The part zero comes from thermodynamics, where they elaborated the first and second laws and then some smartalek came along and elaborated an even more fundamental law and since they didn't want to renumber the other laws, they made this one the zeroth law of thermodynamics. How's the book coming? I worked on it for a short time yesterday. What happens is that as I build boats or teach others how to build boats, a light comes on now and again and I have some insight into a better way to do something or discover what I think is a reason why something was done a certain way and then want to incorporate that into the book. And so, as one comment pointed out, the writer is under the illusion that he can never finish the book because there is always more to discover. But regardless, I'm getting closer. One of the problems of instructional book design is that I want to cover the construction of different models of baidarkas in this book as well as different construction techniques and am wrestling with the best way to approach this problem. For instance, you can join deck beams to the gunwales either by doweling them or by doing mortise and tenon construction. I favor doweling because it is faster and simpler. However, I do want to explain how to do mortise and tenon construction. Another instance of design variation would be the use of flat ribs vs. round ribs. My dilemma is how to best organize the information so as not to confuse the reader with a whole bunch of options. I personally like information presented in a sequential manner and don't like having to skip around to consult appendices in other parts of the book, but to have all the options in the main flow of the book would be confusing, it seems. I think I'm talking myself into having a main flow, a recommended way of building the boat with options at the end of each chapter. By the way, the second edition will have all the info from the first edition, but there will also be info on how to build different models of baidarkas, like the long skinny ones from Akun and a short version of my own creation, plus two seaters and so on. And there will be a lot more pictures. I want the thing to be more like a comic book with pictures leading the way.